The Ukrainian Helsinki Human Rights Union together with Media Initiative for Human Rights (MIHR) have developed a step by step instruction that is designed for families of citizens of Ukraine who has been engaged in schemes involving illegal drug trafficking in Russia by deceit, blackmail, and coercion. 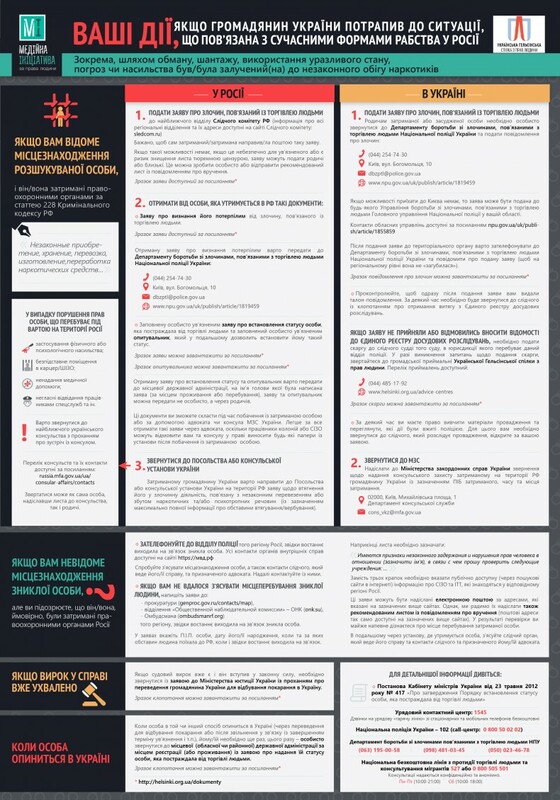 The infographics, which has been created in consultation with state authorities, is, in fact, visualization set of recommendations for the simple but necessary steps to be taken so that the person was recognized as a victim of trafficking (if the fact actually occurred) and to ensure rights of citizen of Ukraine in places of captivity in Russia and to return them to Ukraine. To simplify the task for the relatives of victims, as well as to save them time, the instructions contain links to sample documents to be submitted to state authorities. The samples of documents can be downloaded here. Also, human rights defenders have published recommendations for people, who do not know where their relatives are but suspect that they could be detained. Understanding the complexity of the problem, human rights organizations do not offer simple solutions and do not promise to return the victims to Ukraine tomorrow. Instead, the task of the instructions is to inform about a set of relatively simple steps: firstly, to not sit back; secondly, to provide maximum protection to a man into the trouble against possible dangers that are quite common when it comes to Russia’s places of captivity and the presence of citizens of Ukraine there, and, thirdly, to establish the fact that the person is a victim of human trafficking that is strategically important. The instruction is being shared in social networks of MIHR and UHHRU. Human rights activists also expect to spread it in the media and plan to print it for distribution in the regions.